I explored the relevance of ‘The Innovator’s Dilemma’ to the pre-press and printing industry in this 2004 article in the late, lamented Seybold Report. Package printing is about 8 times the size of the display graphics market. It includes printing on labels, folding cartons, corrugated, films, and containers of all types. Today, only a small fraction of this print is digital. This session will examine whether this represents an opportunity for equipment vendors and for print service providers who already understand how to make profits with digital printing. What are the technological, commercial, and other hurdles that need to be overcome to make digital printing mainstream in the world of packaging? What will it take to win? Join industry veteran Chris Lynn, co-author of ‘Industrial Inkjet for Dummies’ to find out. Come along on Nov 4th at 9.00am to Room B217. Print samples – seeing is believing? Jim Hamilton of Infotrends wrote a blog post today in which he highlighted the role of print samples in the sales cycle of digital printing equipment. He specifically cited the initial reluctance of vendors to let potential customers actually get close enough to the samples to make a judgment on their quality. 1. Alpha machine: the machine is barely out of the laboratory, and the samples have significant defects, so prospects get to see just enough to believe that the demonstration machine is not all smoke and mirrors, and that it actually prints. The printed images and the substrate are carefully chosen to minimize visible defects. An example would be a busy image with plenty of irregular detail that makes aliasing (‘stair-stepping’) and inkjet ‘jet-outs’ hard to see. 2. Beta machine: this is pre-production equipment and most of the bugs have been ironed out. The images and the substrate are again carefully chosen to optimize the appearance, but defects might still be visible to prospects, who are now able to look closely at the samples. The machine might still be unable to meet its design specification in other ways: perhaps the quality cannot be sustained over a long run, or perhaps it cannot print the displayed quality at full production speed. 3. Production machine – sales qualification: the new machine is in production, and now performs to spec. The samples freely shown and given away at trade shows or sent to prospective buyers accurately represent what the machine can do – at its best. (Why would a vendor want to show anything less than their product’s best output?) So the samples are again on an ideal substrate, but perhaps with a selection of more-representative production images than earlier. These samples are used to qualify the prospect: because they are the best that the system can produce, if the prospect still doesn’t think they meet their business needs, there is no point in wasting further sales time. 4. Production machine – sales process: The vendor is confident that the print quality meets the needs of the target market, and potential customers have to be convinced that it will meet their own specific needs. So, having accepted the potential print quality as shown by the samples in the previous stage, the prospect now needs to see representative production work done on the substrates he actually uses. The vendor runs the customer’s jobs with the customer’s substrate, or perhaps provides samples from an existing user with similar work. These samples might be provided in a live demonstration. 5. Production machine – acceptance testing: with the order closed and the machine either ready for delivery (factory acceptance test, or F.A.T.) or on site (site acceptance test, or S.A.T. ), a standard set of test images are run, using a reference substrate. These are designed to show that the machine meets its specification, so they may include test patterns that – in contrast to the images guardedly shown at stages 1 & 2 – are specifically designed to show print defects. If the acceptance tests are passed, any future problems of print quality can be confidently ascribed to service problems, changes in substrate or operating conditions, or operator error. Back in the days when desktop publishing was roiling the pre-press industry, I had a colleague who maintained: “Believe nothing of what you see on a computer screen, and half of what you see in a print. Only believe the film separations.” In the world of digital printers, film has gone away, but the injunction to be cautious about print samples still holds true. Here’s an update to the label plant simulator. This one models the effect on profitability and process time of having different distributions of run-lengths among incoming jobs, and routing them either to a single flexo press workflow; or to a 2nd flexo press; or to a stand-alone digital printer with separate die-cutting; or to a hybrid system (an inkjet engine mounted onto a flexo press) into which all manufacturing operations take place in-line. If you have been following my work with the DICE(TM) printer, you will not be surprised to learn that hybrid is best! “My experience, selling disruptive technologies B2B, has led me to this conclusion: if the prospect’s primary focus is ROI, (s)he’s not a real prospect. To expand on this: conventional capital investment analysis (ROI, IRR, payback, etc) is like using PowerPoint – it forces you into a mindset that restricts your thinking. To take one example from the printing industry, many printers look at digital printing investments in terms of the potential savings they can bring in labor, materials and time. They fail to consider the potential of new market opportunities brought by the ability to deliver short-run jobs that would have previously been uneconomical; and to deliver work just-in-time in smaller batches. 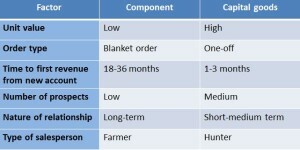 These could mean incremental customers, higher pricing or a higher barrier to entry for competitors. Validating these benefits needs research, and possibly a leap of faith (‘build it and they will come!’), but their impact will far outweigh the easily-determined cost savings that go into a conventional ROI analysis. I’ll be presenting a talk with the title ‘Test Before You Invest – A Manufacturing Simulation Tool to Judge Digital Printing Investments’ at the 24th IMI Inkjet Printing Conference in Orlando, FL on Feb 5. Details of the conference are here. The simulation video is here. This simulation compares the productivity and profitability of conventional flexo printing with a stand-alone digital printer (which requires a separate die-cutting operation), and a ‘hybrid’ flexo+digital solution in which the digital printer is mounted in-line with the flexo press. In the hybrid case, the flexo print units can be used for priming and varnish-coating, and the finishing is done inline, with no loss of productivity. Here’s an interview by Kevin Karstedt of WhatTheyThink.com with me discussing the DICEweb system produced by my client Prototype & Production Systems, Inc. The scenario is familiar: it’s getting near the end of a critical quarter or year, and sales are below where they need to be, so the CEO tells the head(s) of sales & marketing to “do something – or else!” If the company sells consumer products, B2B consumables, services or low-cost equipment, there are many options for promotional initiatives that can influence short-run orders: special pricing, ad & email campaigns, sales incentives, coupons, and so on. 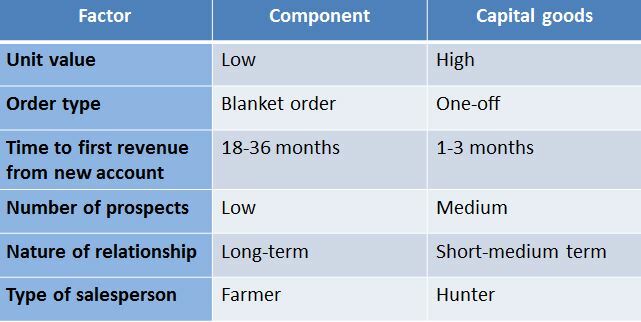 But if your business is selling a specialist (non-commodity) component of a much higher-value product, many of the classic sales promotion techniques are likely to be ineffectual or counter-productive. The key difference that can be summarized from this table is that, for the specialist component supplier, it’s all about ‘design wins’. As the vendor, your task is to get the capital goods manufacturer (or OEM – Original Equipment Manufacturer) to design the component into their next generation of product(s). And since the timescale over which the products are developed is typically long, there is nothing you can do to influence this quarter’s sales to new accounts. Other marketing initiatives – lead generation campaigns, improved product specs, new branding, better sales training or whatever – may be perfectly rational for growing the business, but simply cannot help the CEO make this quarter’s numbers. So, if new account acquisition is not going to help revenues in the near-term, what can you as the component vendor do to increase sales to existing customers? Hiking the price is a possibility, but likely to be difficult in the event that the existing customer is probably buying under a supply contract or ‘blanket order’ (a long-term order with many regular shipments). It may also prompt the customer to look more closely at competitors’ products when it comes to the design of their next-generation of equipment. The temptation is to go the other way: to lower the price on certain products for a limited period – “This month’s special offer!” This might succeed in driving sales in the short run, but it is likely to be disastrous in the not-much-longer term. Every buyer knows that the best time to buy a new car is at the end of the current model year or the dealership’s financial reporting period. Do you really want to educate them into believing the same is true for your business? Not only is this damaging to your brand, but worse, you are “stuffing the channel”. In other words, unless the OEM has enough additional sales to use up the extra components he has bought on special offer, your products will sit in his inventory instead of yours, and therefore reduce your sales in the next one or more periods until they are used up. 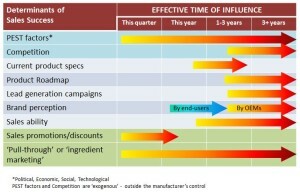 Is there therefore nothing you can do to influence short-term component sales without damaging future prospects? There is, and it takes the form of two related initiatives: a Marketing Development Fund (MDF) and Ingredient Branding. The MDF effectively provides money to the OEM to help them sell more of their products. You might allocate 1-2% of the value of your sales to the OEM (in cash or in kind) to support their advertising, trade shows, sales seminars, and so on that will drive short-term demand for their – and therefore, your – products. In some cases, the component vendor might even collaborate with the OEM to provide sales prizes and other direct incentives to the OEM’s salesforce. So that you get maximum future value from this discount, you might require that the OEM puts your logo on their promotional materials, and you might tie this in with your own Ingredient Branding campaign. There is no room to explore Ingredient Branding in depth here, but the classic ‘Intel(TM) Inside’ campaign gives the general idea. Intel’s CPUs were a crucial but invisible component of PCs made by a variety of OEMs, but Intel successfully promoted its technology directly to consumers, and through joint marketing with its OEM customers, to make its products not only visible but apparently essential for discerning buyers. GoreTex(TM) is another example of similar Ingredient Branding. To summarize: the assumption here is that a new product takes 12-18 months to come to market, so the component vendor sees no sales benefit from a ‘design win’ for that period. Discounting is likely to be counter-productive in the longer term, whereas ‘pull-through’ marketing that drives sales of an existing customer’s products can drive sales in a much shorter timescale. Marketing Development Funds stimulate this pull-through, and Ingredient Branding can add a strategic element of value.